A word is a unit of language that has a phonetic value‏‎ (i.e. a sound) and has a meaning. It can also be written down in which case it will have a certain spelling. They are – as you might well imagine – the building blocks in English language learning and teaching English. The collection of words in a language is known as the vocabulary and when collected together they are listed in a dictionary. Speaking linguistically, a word can be described as the smallest possible unit in a reply. This is a single word and fine. Anything smaller isn’t a word at all and makes no sense. I’d like some cake, please! A word consists of one or more letters‎. The two most common single letter words are I and a. The longest word cited in the Oxford English Dictionary is pseudopseudohypoparathyroidism (a type of disease). 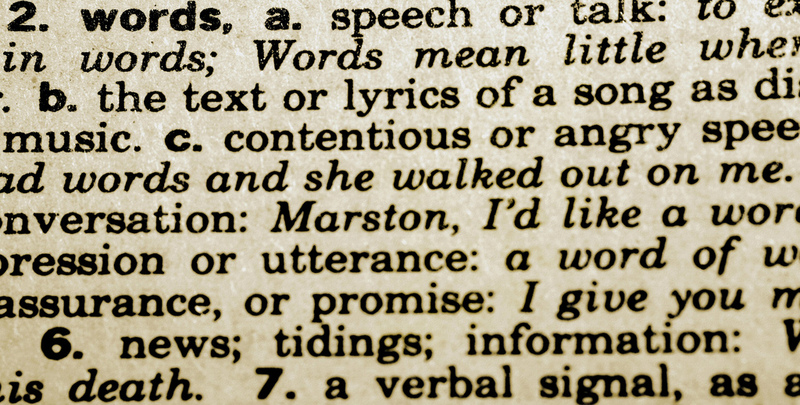 Words can also be combined to create phrases‏‎, clauses‏‎, and ultimately sentences‏‎. So how many words are there? There are still many questions remaining about words in terms of what actually constitutes a word. This means the question of how many words a language has remains debatable. Is dog the same word as dogs? Is Olympic the same word as olympic? Is lebensraum an English word? What about bungalow or apartheid? Vocabulary‏‎ – how many words are there? And how many do you know?